Ferretti Group always takes center stage when it comes to quality, incomparable luxuriousness, and exclusivity. 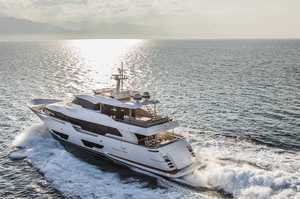 Within that context, the Ferretti Group launched the superyacht Custom Line Navetta 28. This yacht represents an efficient package made in collaboration with the Development AYT&D department and the in-house Centro Stile, in partnership with Zuccon International Project. 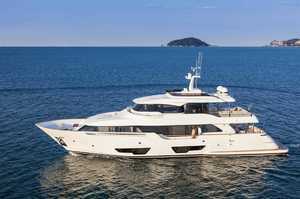 The yacht intertwines flawless sea-keeping ability and famous Italian elegance. The Custom Line Navetta 28 simply captivates you with its traditional long-range cruiser and sports yacht traits. 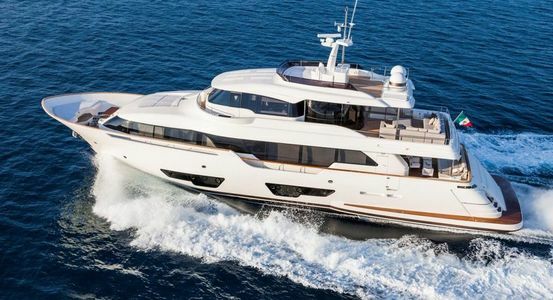 She merges some facets of her "sister" Navetta 33 Crescendo such as the line’s flagship; however, the Ferretti Group incorporated a patent of Dual Mode Transom system that utterly redesigns the aft outer area. 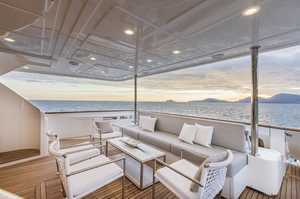 The design of the outside has been done by the Ferretti Group and Zuccon International Project. The yacht is quite big since its overall length is 28.31m and it is 7 meters wide, thus allowing 20 people on board. The maximum beam is 7 m - 22 ft 11 in. Nevertheless, they succeeded in making it aesthetically lovely and light. These features are achieved due to the applicability of the windows. Mega yachts have big windows on the upper decks but this boat also boasts big windows below. If you go down and look through the windows, you can see that the window is placed just so you can see both under and above the sea level at the same time. It has to be mentioned that even though on a big yacht, it can be difficult to find some privacy. But on this yacht one just needs to wonder out to the bow to find a secure refuge. Sofa, table, and a sun deck are there waiting for you and they offer the best seats in the house. If you want to enjoy the beautiful panoramic scenery, you need to go to the Sunbridge. It doesn’t change its meaning even if it rains. It provides everything one’s soul may desire. Barbecue, sink, fridge, ice-maker and you can even have a whirlpool installed. Walking further, a U-shaped sofa is positioned in the center facing an armchair and a low cabinet. A concealed TV screen is placed in the ceiling, available in different sizes. Thanks to its 180°, it can be watched from both the outside and inside area. 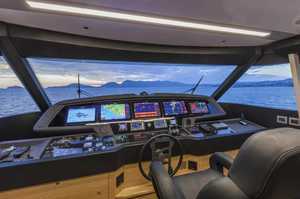 The salon and other areas are lit by LED built-in lights; however on this first hull, LED light strips have been added. One of the most impressive parts of the ship is assuredly the luncheon area found on the upper bridge surrounded by the unreal panoramic and semi-circle sliding glass doors. The boat has a semi-displacement hull, so it’s not the same shape as a pure displacement with the rounded underwater hull; nevertheless she has an edge that gives it more stability when rolling. At 10 knots, she consumes roughly about 100 liters per hour and with the full petrol tank of 12.400 liters, you could go 12.400 miles. At a speed of 8 knots, each engine is consuming 25 liters an hour, so 50 in total, which means we are looking at an additional 2000 miles to the tank. The maximum speed of this beauty is 16 knots while the cruising speed is approximately around 13.5 knots. 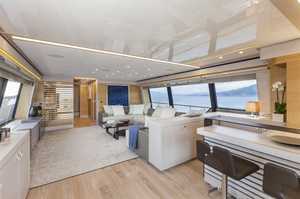 One more positive trait of the Custom Line Navetta 28 is that it is perfectly tranquil, silent and vibrationless while speeding up to 16 knots. As already mentioned, it is 28 meters long, but it can turn in 50 meters or less. When the waves come to the side of the boat, you can be assured of the boat’s stability. The Dual Mode Transom system mentioned in the introductory part comes to life in this section. The tender issue is resolved quite conveniently. The floodable garage has been patented by the Ferretti Group. To launch the tender, the hatch is closed, the water comes only under the tender and the launching of the boat is done with the press of a button. Nothing could be easier. When the yacht is underway, the dock drains automatically with the assistance of one-way valves. It all looks really simple and it is. Apart from the plainness, it is safe and clever too. Perhaps, the most extraordinary things about it are the simple features of its mechanics which allow the pins to move only in pairs. And the great thing about this system is that is completely electrical. The transom hatch is hinged with retractable pins in two places. This hatch can be folded down via a central actuator. So this way, a beach area is made while you can unship a portion of the teak deck from the roof of the garage and slot it into almost double the beach area’s size. You can find two parasols and two lounge chairs making this section a great sunbathing place. Indeed, even the cockpit provides a multi-function sunbathing area. 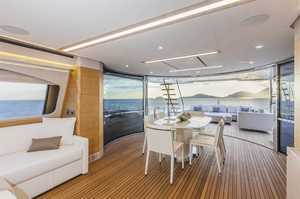 The interiors of the Custom Line Navetta 28 comprises of 6 grandiose cabins, three double and one twin, as well as two VIP cabins, all positioned on the lower deck. They all have separate showers and en-suite heads. Due to the long-stretched, continuous windows, natural light and spacious volumes are the dominating features of the interiors. 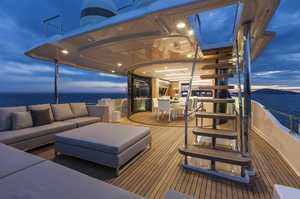 State-of-the-art furniture and furnishings have been embedded within the yacht. The master room contains a wide walk-in wardrobe, already mentioned large windows and the shower room which has an option of converting into a Turkish bath. The bathroom is a wonderful example of design. All cabins are beautifully decorated and furnished in Italian style, luxury, and elegance. Sound absorbing materials are built in the ceilings. 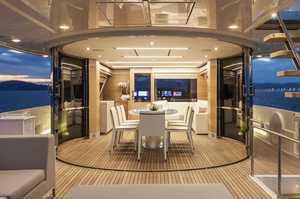 Undoubtedly, soundproofing is one of Ferretti’s backbone advantages. Water pumps and generators are installed well aft. 54 decibels are recorded in the master cabin at WOT, which decreased to 47 decibels at 12 knots. On the lower decks, the sound levels are slightly higher; however they do not cross the sound limit of 64 decibels at cruising speed. The Ferretti is at the forefront even when it comes to the entertainment systems. You can manage any and all devices from your iPad via ‘VOTIS’ (Videoworks One Touch Infotainment System). This system replaces all the remotes on the yacht. Italian yachts have always stirred the soul of any hard-core enthusiast and that’s what the Custom Line Navetta 28 does. With her contemporary décor features and design, the owners and guests simply dismiss the routines and enjoy on the open sea. 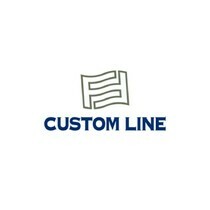 It’s developed to set your mind at ease and enjoy cruising for many years to come. Indeed, she has a lot to offer. Tremendous technology installed on the boat is breathtaking as well so don’t miss out an opportunity to cruise in this paradise and contact us as soon as possible. The sale of the beauty is entirely up to you. She is waiting for you.